According to several sources, Yahoo’s SVP of U.S. Revenue and Market Development Joanne Bradford (pictured here) is planning on leaving the Internet giant to take a new position as chief revenue officer of online content upstart Demand Media. The surprise move is sure to have reverberations throughout the online advertising arena, but more so at Yahoo (YHOO), where Bradford’s job encompasses a wide range of key revenue-generating duties. She has also been tapped as one of the execs to play a key role in the recently approved search and online ad partnership with Microsoft (MSFT). Yahoo declined to comment. BoomTown has also contacted Demand and is awaiting comment. Bradford had actually once been a Microsoft exec, serving as VP and chief media officer of MSN Media Network. She had worked at BusinessWeek before that. Bradford came to Yahoo in the fall of 2008, at the tail end of the tenure of Co-founder Jerry Yang, who stepped in as CEO after the previous CEO Terry Semel departed. Immediately previous to her job at Yahoo, she had been helming national ad sales at then-trendy Los Angeles-based ad services company Spot Runner. Demand will be her second time going from a large company to more of a start-up. But–unlike the troubled Spot Runner where Bradford worked for only six months–Demand has been on a growth tear of late with a social media strategy that is also being pursued by AOL (AOL) and others. It owns heavily trafficked sites, such as how-to juggernaut eHow and the health- and fitness-focused Livestrong.com, putting Demand in the list of the top 20 Web properties. It reportedly has about $200 million in annual revenue–mostly from advertising, but also from a domain registration business–and is profitable with several hundred employees. The Santa Monica, Calif.-based company is headed by serial entrepreneur Richard Rosenblatt (pictured here), former chairman of Intermix Media. Intermix was the parent company of MySpace, which was sold to News Corp. (NWS). Via its Demand Studios, the company uses an army of freelancers to produce all kinds of content for its sites and others, using a complex automated system, but which also includes vetting and editing. In fact, irked at the characterization of Demand as a content spammer, Rosenblatt even issued a manifesto for Demand in January. The role of Demand Media, said Rosenblatt, was to help readers solve problems, laugh and get good advice, while figuring out how to create a profitable media business in the digital age. If Rosenblatt is successful, Demand appears to be aiming for an IPO or merger with another company. Ironically, Demand has also been eyed by Yahoo in the past, as a possible acquisition. Nabbing a top Web exec like Bradford from Yahoo is obviously a definite step in raising the stakes for Demand with big, established advertisers. That’s because Bradford is well-regarded in the industry and is a prominent player. She recently signed a high-profile deal with Hollywood producer Ben Silverman to create premium content for Yahoo. Bradford’s departure will be seen, both internally and externally, as a definite blow to turnaround efforts by CEO Carol Bartz. 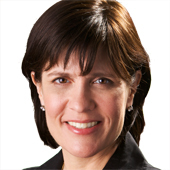 Bradford currently reports to Hilary Schneider, EVP of Yahoo’s U.S unit. My reporting does not indicate that Yahoo’s top brass know about Bradford’s expected move, so it is not clear who would replace her at the Silicon Valley icon, which has been hard hit by an exodus of talent over the last two years. Internal candidates could include 11-year Yahoo veteran Mitch Spolan, VP of North American sales, or Seth Dallaire, a former Microsoft exec whom Bradford brought to the company last fall as VP of mid-market sales, a newly-created role responsible for all mid-market sales efforts across search and display advertising.